Last month the Bristol, TN Herald Courier published an article that discussed a new management technique for keeping the balds on Roan Mountain intact. The article stated that the Appalachian Trail Conservancy had just announced that they will be testing the use of a small herd of angora goats this summer in order to maintain the grassy balds at Round Bald, Jane Bald, Grassy Ridge and Hump Mountain. Although goats and cattle have similar management issues, goats are much easier to manage due to the smaller scale. While on the mountain, the goats will be kept in portable, solar-powered paddocks about the size of an acre. Once the unwanted vegetation in an area is consumed by the herd, the corrals will be moved to a new spot. Volunteer goat herders will be needed to haul water and keep watch over the herd throughout the summer. Assuming the test at Roan Mountain is successful, what do fans of the two balds maintained in the Smoky Mountains (Gregory and Andrews) think? Would the use of angora goats be a better alternative for maintaining these two balds as opposed to the current use of mowers and trimmers? The reason I raise this issue is due to my recent experience on Gregory Bald last month. Just days prior to our visit, the Park Service had mowed the grass and, as a result, left the trimmings on the ground. Not a big deal at all, but it did serve as a reminder that modern civilization still touches even the highest mountains. More importantly, does the noise from the mowers pose any problems for hikers? Or, would the presence of a corral of goats be such a negative that they would outweigh any of the benefits. What’s your opinion? If the Roan Mountain experiment is successful, should the Smoky Mountains look at using a similar plan for Andrews and Gregory Bald? 1. What name did the Cherokee Indians give to the Smoky Mountains? 2. Roughly how many people visit the Smoky Mountains each year? 4. In what year was Great Smoky Mountains National Park established? 5. Roughly how many species of living organisms are there in Great Smoky Mountains National Park? 6. What is the most visited area of the Great Smoky Mountains National Park? 7. Which U.S. president dedicated the Great Smoky Mountains National Park in 1940? 8. Based on last count, roughly how many black bears live inside the Park? 9. What was Gatlinburg’s original name? 10. What is the nickname for Lakeview Drive, the 6-mile scenic drive that ends at the mouth of a tunnel near Fontana Lake called? 11. How many miles of hiking trails lie within the Great Smoky Mountains National Park? 13. How many different species of flowering plants grow in the Smokies? 14. Which mountain in the Smokies did the Appalachian Trail originally traverse before the trail was re-routed? 15. Fodderstack is the original name for which famous point in the Smokies? The following is a semi-challenging list of Smoky Mountain trivia questions. Actually, people intimately familiar with the Smokies will probably find most of these questions to be fairly easy. However, there are a couple questions that may trip up even some of the most knowledgeable Smoky Mountain history buffs. Answers will be posted on this blog tomorrow. If you can’t wait until tomorrow, or if you’re looking for some clues, my web site, HikingintheSmokys.com, will provide answers for several of these questions – if you know where to look. I just wanted to share this with you. The video below has some of the best film footage I’ve seen of the Smokies. There are a wide variety of scenes from all over park. Check out the shots of the fog during the morning dawn. Incredible. Although we’re already half-way through the summer, there’s still a lot of time left for vacations and adventure travel. Instead of traveling to some far-off vacation destination, why not travel over to the national park in your own backyard? With roughly 50 percent of the U.S. population within 500 miles, Great Smoky Mountains National Park is an excellent choice for a little adventure travel. With a sluggish economy and high gas prices, traveling to Great Smoky Mountains National Park is a great way to stretch your entertainment dollar. You can’t beat the price of admission; Great Smoky Mountains is the only major national park that doesn’t charge an entrance fee. The main attractions in the park are all free as well. Choose from over 800 miles of trails to create your own adventure. Check out one of the many waterfalls in the park, or take a hike in the high country for some spectacular vistas. If your preference is seeing wildflowers, stop by one of the ranger offices and ask what’s in bloom. There’s something in bloom somewhere in the park almost any time of year. Another free adventure option is to take your bike for a ride around the pastoral settings of Cades Cove. The Park Service closes the 11-mile Cades Cove loop to motor traffic on Wednesday and Saturday mornings. Another adventurous way to see the national park is on horseback. The park has hundreds of miles of horse trails as well as five drive-in horse camps. If you don't own a horse, there are four rental stables that will provide you with mounts and guides. Maybe hiking and adventure travel isn’t really your cup of tea. Don’t worry; the park still provides many activities for those that like more leisurely pursuits. Wildlife viewing is very popular within certain areas. Go to Cades Cove in the mornings and early evenings to see black bears, white-tailed deer and wild turkeys. The Cataloochee Valley is the best place for spotting elk which were recently reintroduced to the park in 2001. The Smoky Mountains also boasts nearly 80 historic structures that have been preserved or rehabilitated. Feel free to walk in and explore the many houses, barns, outbuildings, churches, schools, and grist mills from the late 1800s and early 1900s. All this sightseeing is naturally going to make you hungry. Make sure you bring a picnic lunch or dinner with you. There are eleven picnic areas within the park. There’s also more than 2100 miles of streams where you could roll-out a blanket and enjoy the scenery while picnicking. With all those streams, there’s also plenty of fishing opportunities. You can really make your dollar stretch by camping in the great outdoors. There’s nothing better than sitting around a camp fire and watching the stars after a hearty dinner cooked over an open flame. The park has 10 campgrounds from which to choose from. If you’re not into roughing-it you could stay in one of the gateway communities. Being as popular as it is, Gatlinburg can be a relatively expensive option. However, if you travel to Townsend, Cosby, Cherokee or Bryson City, you’ll be able to find more affordable lodging. Restaurants will also be cheaper in these towns. Furthermore, if you opt to stay at one of the many cabins that the Smoky Mountain area is famous for, you could save a lot of money by cooking your own meals instead of eating out every night. Another reason to stay at one of the smaller towns is that you won’t have the constant temptation of dropping cash on places like Ripley’s Haunted Adventure or Hillbilly Golf. Whether you’re looking for adventure travel or just an inexpensive vacation, the Great Smoky Mountains is an excellent way of getting more bang for your buck. And, it’s most likely right in your own backyard. You could spend a weekend or a full week here and you’re almost guaranteed to spend much less than you would if you were to go to Disney World or Las Vegas. If you've been over to the HikingintheSmokys.com website in the last couple of days you may have noticed the addition of the new hiking store. Although all of the products on the site are currently available for purchase at this point, we are still in the process of building the store and fine-tuning the design. The intention of the store is to offer top quality hiking gear and apparrel, as well as books and DVDs related to the Smoky Mountains. Any feedback about the store is welcome. Are there any hiking related items or brands that you would like to see? Are there any other categories of Smoky Mountain related books that we should add to the site? Is the navigation of the site easy to follow? Please feel free to leave a post on this blog or you can email me at info@hikinginthesmokys.com. Below is a Youtube video showing a black bear breaking into a car at the Clingmans Dome parking lot in the Smoky Mountains. The amazing thing about this video is that there are a couple dozen people that stood around and watched the bear break the window of the car, jump in, and then take the owner’s food. In my view, these people were totally irresponsible. Why didn’t they chase the bear off and call the Park Service? Not only was this car damaged, but that bear probably caused more trouble for other cars, campers or, possibly even acted aggressively towards some hikers. It would not surprise me if that bear had to be destroyed because it was, or became, a problem bear. No doubt the car owner made a huge mistake by keeping food in a car with its windows partially open. However, those people that stood around and watched the bear taught it not to fear humans. There in lies the problem. Where are all the buses going? If you’re anywhere near the Smoky Mountains, those buses are likely taking passengers to the gambling casinos in Cherokee, North Carolina. And if these passengers are indeed planning on doing some gambling, they’re more than likely heading to Harrah's Cherokee Casino & Hotel. If you’re looking for something to do after a long day on the trail, head over to the North Carolina side of the Smokies for a little gambling over at Harrah’s Cherokee Casino. The casino offers all of the popular games including table games, video gaming, video poker and raffle reels. Denominations for most of these games range from a nickel to $100. There’s more to Harrah’s than just casino gambling. Harrah's Cherokee is also a 15-story luxury hotel that includes two restaurants, a conference center, gift shop, indoor swimming pool, hot tub and fitness area. Harrah’s Cherokee also has live entertainment, including top acts such as Willie Nelson, BB King, Jeff Foxworthy and Hootie & The Blowfish. Maybe Harrah’s Casino is just a little too big for you? Maybe you’re looking for some gambling fun in a more laid back atmosphere. Check out the Teepee Village Casino or the Cherokee Tribal Casino. Not really into casino gambling? You could play a little bingo over at the newly renovated Cherokee Tribal Bingo center. Either way, a casino gambling excursion in Cherokee is a unique alternative to the everyday hustle and bustle of Gatlinburg. Not to spoil anyone’s fun, but you must be 21 years of age or older to enter any of the casinos. PBS has just announced that in the fall of 2009 it will air a new Ken Burns documentary series: 'The National Parks: Americas Best Idea'. This will be a 12-hour, six-part documentary series, directed by Ken Burns and co-produced by his longtime colleague, Dayton Duncan. According to the release, the series is "the story of an idea as uniquely American as the Declaration of Independence and just as radical: that the most special places in the nation should be preserved, not for royalty or the rich, but for everyone." The film combines stunning cinematography of the beauty and majesty of our national parks with the rich history of their creation. As an example, the film profiles George Masa, the Japanese immigrant whose photographs of the Great Smoky Mountains served in the fight to protect this region in the southern Appalachians as a national park. As with most of the other films produced by Ken Burns, there will be an interactive web site, a companion book, as well as a DVD box set. If this series is anything like some of his previous works, such as the documentaries about baseball, Lewis and Clark, or Thomas Jefferson, then we should be expecting another outstanding program next fall. I just wanted to give a shout out and make everyone aware of a new blog I recently discovered. The name of the blog is called the “Great Smoky Mountains Girl Scout Challenge.” This is a particularly noteworthy blog because the author, Smoky Scout, is raising money to help support the Girl Scouts in North Carolina. To do this, she is hiking all of the trails in the Smoky Mountains with the goal of raising $20,000. There are well over 800 miles in the Park – and it will require her to hike roughly 1000 miles in order to cover them all. Furthermore, she’s going to accomplish this in just one year! Donations to this challenge will help to fund camp scholarships, backpacking equipment, and will also help towards organizing hiking groups for inner-city girls. The needs are great and the benefits are even greater. As a result of this challenge, Smoky Scout will also become a member of the exclusive 900 Miler Club, reserved only for the few that hike every single mile in the Smokies. Please visit her site to follow along as she accomplishes this worthy goal. Every hiker has a list of their favorite trails. After many years of hiking in Great Smoky Mountains National Park, I decided to compile a list of what I consider to be the best hikes in the Smokies. If you’re new to the Smokies, use this article as a starting point in trying to decide where you should hike. If you’re a veteran Smoky Mountains hiker and have a different list, step up and voice your opinion. Tell us what’s on your list and why you like those particular trails. The seven hikes that follow are in no particular order. Nuts & Bolts Start from the Low Gap Trailhead in Cosby for this 2500 foot climb, 12 mile roundtrip hike to reach the summit of Mt. Cammerer. Trail Highlights Climb 2.5 miles up the Low Gap Trail before hooking-up with the Appalachian Trail. Cross over a grassy ridge on the AT before turning onto the rugged spur trail that leads to the summit. Mt. Cammerer is on the edge of a rocky outcropping overlooking the Pigeon River Gorge. On a clear day, the views are simply awesome; some even say the best in the Park. For an even better vantage point, step up to the deck of the stone fire tower. This “western” style tower, which was fully restored in 1995, provides you with 360 degree views. Look in any direction and see row upon row of smoky blue mountains. Trivia Tidbit The octagonal fire tower was built by the Civilian Conservation Corp in the late 1930s using hand-cut stone from the surrounding area. Nuts & Bolts From the Clingmans Dome parking lot, hike 1.7 miles along the Forney Ridge Trail to reach Andrews Bald. Total elevation gain on the roundtrip hike is 900 feet. Trail Highlights Only a 1.7 mile hike to see magnificent views? Sounds like a breeze. Well, not so fast. Don’t let the mileage fool you - this is a rugged hike! The trail is littered with rain run-off, rocks and small boulders. But don’t let any of this deter you. Thanks to several acres of open grassy meadow, commonly referred to as balds in the Appalachians, spectacular views of the southern Smokies await you at the end of this hike. Andrews Bald is the perfect place to open up a blanket, relax, and enjoy a picnic. Trivia Tidbit Without maintenance from the Park Service, Andrews Bald would be reclaimed by forest. Nuts & Bolts Head east from the Newfound Gap parking lot and hike 4 miles along the Appalachian Trail to reach Charlies Bunion. You’ll climb a total of 1640 feet during the roundtrip hike. Trail Highlights A long steep climb from the parking lot quickly leaves most of the crowds behind. Eventually you’ll reach a long stretch of trail that traverses a ridge where you’ll be hovering around an altitude of roughly 6000 feet. Being at the highest point along this narrow ridge, with views on either side of the trail, you’ll feel like you’re walking along the spine of the Appalachians. Trivia Tidbit The current name of this popular destination is a result of when Charlie Conner was hiking with Horace Kephart, one of the early proponents of a national park in the Smokies. When they paused for a rest, Conner took his boots and socks off exposing a bunion that looked like the surrounding rocks. Looking at Conner’s feet, Kephart remarked, “Charlie, I’m going to get this place put on a government map for you.” And so he did. Nuts & Bolts This is a moderate roundtrip hike of 4 miles beginning out of Greenbrier, just east of Gatlinburg. Trail Highlights The Porters Creek Trail just about has it all. You’ll stroll along a beautiful cascading stream through a lush old-growth forest, while walking past many remnants of the early settlers in this area before reaching a little known waterfall. If you hike this trail during the spring you’ll have the additional benefit of witnessing the spectacular displays of wildflowers. The forest floor was carpeted with bloodroot, hepaticas, violets, white trilliums, fringed phacelia, rue anemone and many other wildflowers during an early spring hike. At roughly 2 miles, Fern Branch Falls slides and tumbles nearly 50 feet off the ridge to the left of the trail. Trivia Tidbit Roughly 1 mile from the trailhead is a short side trail that takes you to the John Messer farm site which includes a cantilevered barn built around 1875. There’s also a cabin that was built by the Smoky Mountain Hiking Club in the mid-1930s. Nuts & Bolts This is a strenuous hike of 12.5 miles and more than 3600 feet in elevation gain. Start from the Anthony Creek trailhead in the Cades Cove Picnic area. Trail Highlights You’ll huff and puff up the mountain for the first 5 miles of this hike, but your hard work will be paid-off once you reach Spence Field. If visibility is good the grassy meadows up here will afford you with outstanding views of the North Carolina side of the Smokies. If you can arrange it, hike the trail in late spring when Spence Field showcases the most spectacular display of mountain laurel you’ll see just about anywhere. The hillsides and meadows are literally covered in the white and soft pink flowers from this member of the heath family. Trivia Tidbit Yes, this is the same Rocky Top that is now the fight song for the University of Tennessee and one of the official songs for the state of Tennessee. Nuts & Bolts From Cades Cove, climb 3000 feet and trek 5.6 miles up the Gregory Ridge Trail to reach the 10 acre Gregory Bald summit. Trail Highlights As stunning as the year-round views are, Gregory Bald is most famous for the spectacular flame azaleas that bloom on the summit from mid to late June. Azalea lovers from all over the world come here to visit perhaps the finest display of azaleas anywhere on the planet. You’ll see a rainbow of colors including fire red, wine red, orange, salmon, yellow, white, pink, and even multi-colored azaleas. Trivia Tidbit This particular bald is named after Russell Gregory, an early settler in the Cades Cove area. He and other cove residents used the field to graze cattle during the spring and summer when the fields in the cove were needed for growing crops. Nuts & Bolts Take the 5.5 mile hike up Alum Cave Trail to the Summit of Mt. LeConte. You’ll climb 2763 feet to reach the summit of the third highest peak in the Smokies. Trail Highlights If ever there was a classic hike in Great Smoky Mountains National Park, the Alum Cave Trail to Mount LeConte would certainly qualify. Sure, there are trails in the Park that are far longer, that gain more elevation, or have steeper climbs, but the Alum Cave Trail is unmatched in its combination of interesting geological features, history, high adventure and stunning views. Upon reaching the summit, go to Cliff Top near the LeConte Lodge for amazing views of Clingmans Dome and the rolling mountains that lie towards the west. 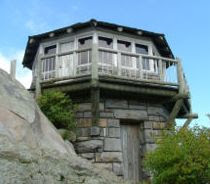 On the other side of LeConte is Myrtle Point which offers outstanding vistas of the eastern Smokies. Trivia Tidbit One of the unique things about Mount LeConte is the lodge and overnight cabins at the top. Hikers can spend the night in one the rustic cabins which can accommodate about 50 guests a night (you'll need to make reservations first). I wanted to take this time to thank the American Automobile Association (AAA) for publishing a short article referencing the launch of HikingintheSmokys.com in the July/August issue of their Home & Away Magazine. The article appears in the Here & There column, a popular front-of-the-book department. With the travel publication being distributed to 1.3 million households, we hope the article will help get the word out and build awareness of our website. My wife and I have been long-time members of AAA and, over the years, have benefitted from their road side services on a couple of occasions. We also enjoy the benefits of their travel services a couple of times a year as well. The National Park Service has announced that it has just awarded the current operator of the LeConte Lodge a new 10-year contract. The most interesting aspect of this new contract is that beginning in 2009, hikers will be able to purchase snacks, beverages and lunches at the Lodge. Up till now, only Lodge guests were able to purchase meals at the Lodge. Will this encourage more hikers to the mountain, and possibly cause issues with overuse on the trails? Or, is this an innovative approach for the Park Service to exploit one of the unique features of the Smoky Mountains and increase revenues for a Park that desperately needs additional funding for various improvement projects.